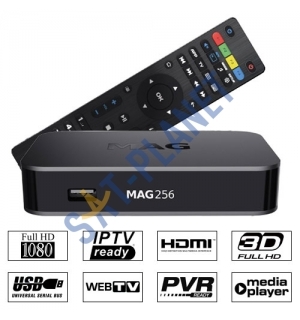 The MAG-256 is next generation IPTV box for the reception of IPTV service on your television set. 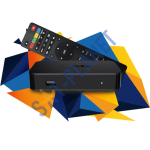 The set top box meets all modern requirements for multimedia devices, including support of video streaming, video on demand, reproduction of digital channels in high quality, and also access to OTT-services (YouTube, Picasa, Online cinemas, a weather forecast, social networks, ets.) and the Internet browser. 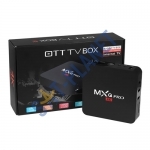 It's offers a faster and more powerful 1.5GHz media processor (ARM Cortex A9 1.5 GHz), additional 1 GB of RAM and HDMI 1.4A supporting the highest video resolution possible. Incresed perfomance allows for resource-intensive applications and more playback features including 3D Video. 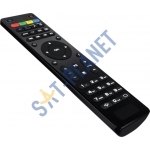 One of actual features of a set top box - is the ability to transform any format of an video input signal in stably transferred image on the screen of the TV panel of any generation. The set top box MAG-256 equipped with two USB 3.0 connectors that makes available additional services - connection of Wi-Fi adapter for connection to the internet "by air", without a Ethernet, viewing a digital content from video and/or photo cameras or other media devices, and also record on external information media. Also there ia an optical audio output of S/PDIF ensures the highest quality of audio.